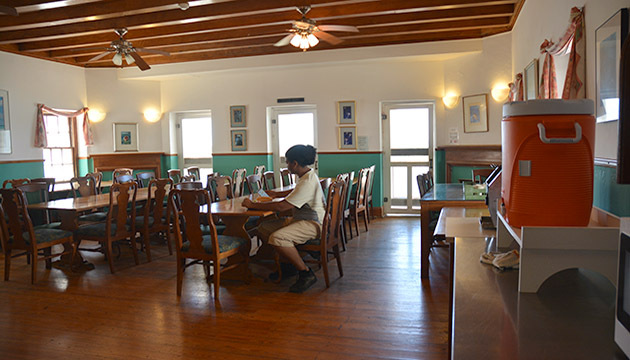 The indoor portion of the Kresge Dining Hall offers cafeteria-style seating for up to 40 people. The outdoor covered and uncovered patios of Wright Hall offer additional seating for another 40 people. The BIOS dining facility provides three cafeteria-style meals daily. 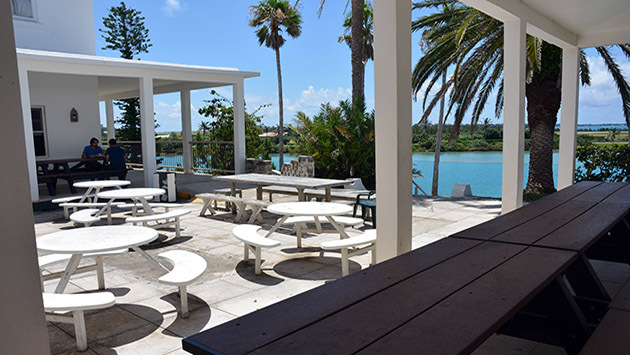 The dining room provides seating for 40 persons with additional seating for 40 on the back patio of Wright Hall overlooking Ferry Reach. Hot lunches are not served on the weekends or public holidays; however, packed lunches can be prepared at breakfast time. Packed lunches can also be arranged for groups/visitors that plan on being off campus at lunchtime. Vegetarian options can be arranged with our chefs with prior notice. Due to our remote location and size of our kitchen, it is not possible to ensure that our dining facility is free from allergens. BIOS is unable to cater to a wide range of food preferences, intolerances, allergies and religious requirements. It is the responsibility of guests concerned with food allergies/intolerances to be aware of the risk of exposure and to be able to respond appropriately. If you have concerns about your allergy/dietary requirements please contact your coordinator.